A loggerhead sea turtle - also widely known as caretta caretta - which was suffering from a head wound, has been rescued by locals off the coast of Söke district in western Aydın province. Local restaurant owner Ahmet Sıvacı saw the turtle having trouble diving while he was cruising in his boat near the Büyük Menderes River delta. Sıvacı brought turtle onboard and sailed it to coast. Sıvacı notified the Sea Turtles Research, Rescue and Rehabilitation Center (DEKAMER), located in southwestern Muğla province, about the turtle's situation. 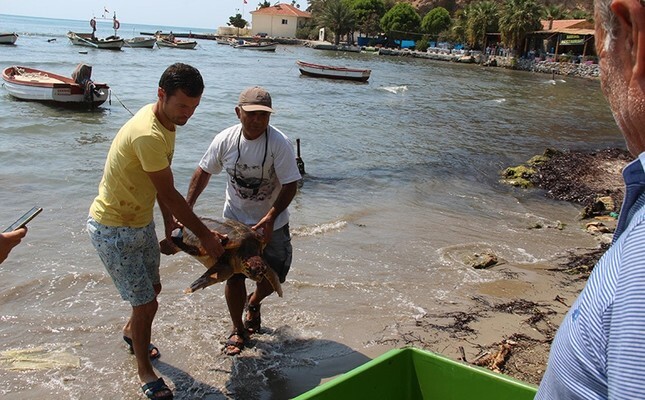 In order to provide it with initial medical attention, the center delivered the turtle to the local branch of the Ecosystem Protection and Nature Lovers Association (EKODOSD) in nearby Kuşadası district. Upon initial control, the team from EKODOSD saw the turtle's left eye was swollen and hurt due to impact, while they suspected that the animal might have received a fracture in its skull, preventing it from diving. The turtle was sent to DEKAMER facility in Muğla's Ortaca district for further treatment in a water tank. Caretta carettas are an endangered species with vulnerable status. Beaches in Turkey, most famously İztuzu Beach, are popular breeding grounds for loggerheads, but these areas are also under heavy pressure from tourism activities. Nevertheless, due to efforts by scientists, activists and increased public awareness as a result of campaigns, many breeding grounds for loggerheads have now been closed to tourists during their breeding season, and sunbeds are not allowed in order to protect their natural habitats, egg nests and reproduction cycles.